I have been away for over a week. I did not get any chance to even look at my little blog page and I have been MIA for ever. Why? Well, its because there have been a lot of things happening in my life – all at the same time. That can be really unnerving. Really! Do not believe me – let me break down all that has happened recently. The woodwork for my new house is almost nearing completion. But it is not complete yet. Its been 2 months and its going through the final touches. And so AB and I have been doing religious rounds of the house trying to put our project management skills to test and getting the designers a little more organised. All our weekends have been going into getting this done. I have also changed jobs – yes I left my old company (lets call it Green) and have joined a new one (lets call it Blue). I was with Green for almost 3 years. And I miss it terribly. I had made some amazing friends in Green. Blue is new – and I am terrible at getting settled down. So I am getting used to Blue. People at Blue are all nice. But they are colleagues – and folks at Green had become friends. So the transition for folks in Blue from colleagues to friends would need to happen for me to love Blue the way I loved Green. That said, I am really looking forward to my work at Blue – it sounds all challenging and everything. With so much happening in my life over the weekends and weekdays, my going MIA was a given. But this weekend, AB and I decided to get some time out for ourselves. And we did. We partied with friends on Saturday and I spent sometime at the spa on Sunday. There is no worry in life that a good mani-pedi cannot cure! And while I was at it, the idea to represent the Green and Blue in my life came into my mind and hence my nail art :). I promise to be back with a little more REGULAR updates. 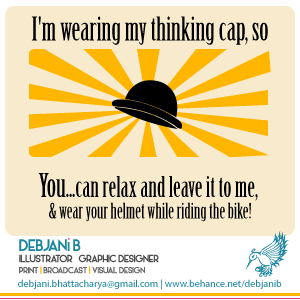 But till then – Love from thebangaloresnob! When in doubt – Saree!